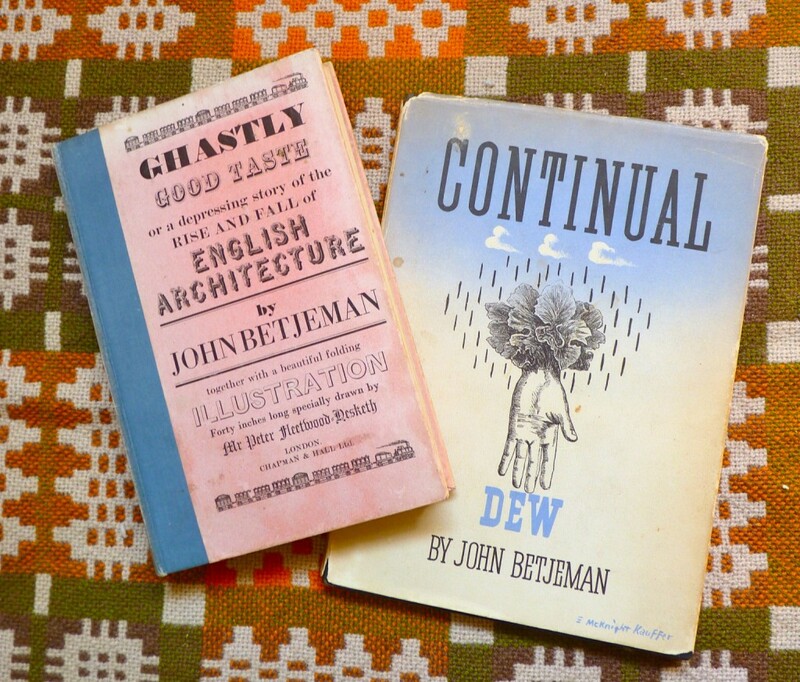 John Betjeman hated experts, antiquarianism, art historians and research fellowships. As his daughter Candida Lycett Green has pointed out, he never set out to champion conservation in the academic sense of that word, but rather to work in the cause of what he called ‘indeterminate beauty,’ a quality invariably left out of official lists and heritage campaigns because it is impossible to define. 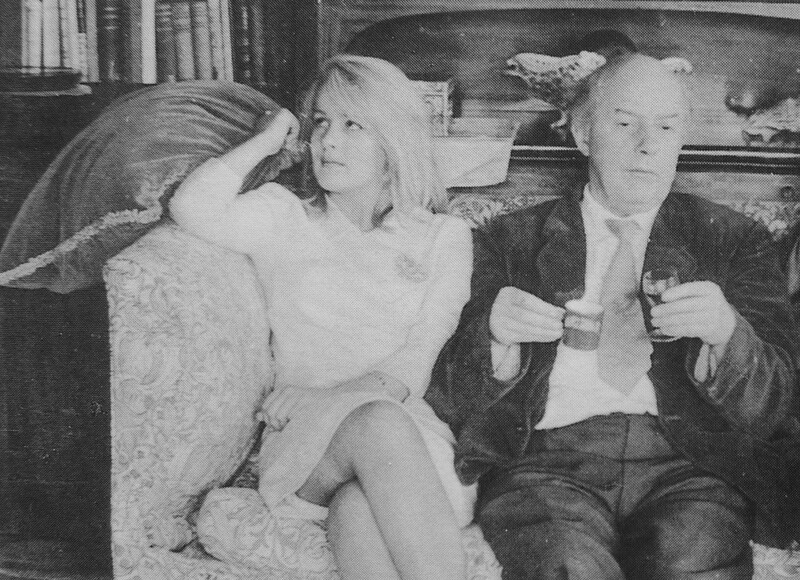 John Betjeman and his daughter Candida in 1962. It was this appreciation for the legacies of his middle class upbringing that went to make him such a sympathetic figure, someone whose imagery, humour and understanding chimed with thousands of others, the eager audience for his books and journalism and television broadcasting after the war which was to destroy so much of what they were used to. His efforts in the 1930s and after the war, and those of others like him, are celebrated in English Heritage’s new free exhibition in the Quadriga Gallery of the Wellington Arch at Hyde Park Corner, Pride and Prejudice: The Battle for Betjeman’s Britain, from 17 July – 15 September. 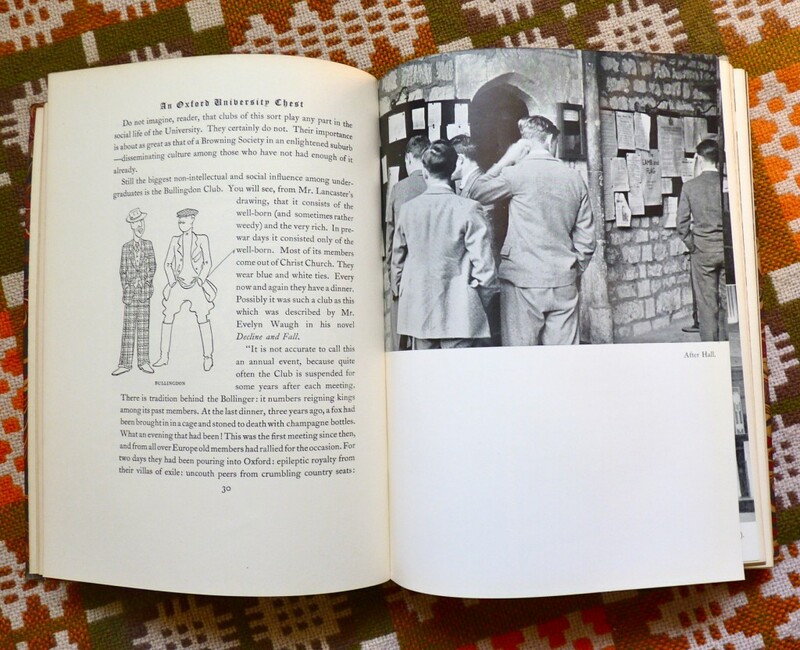 Betjeman’s love of the Church of England percolates through his poetry and writing, showing modern Englishmen and women how to love their churches and their Church. 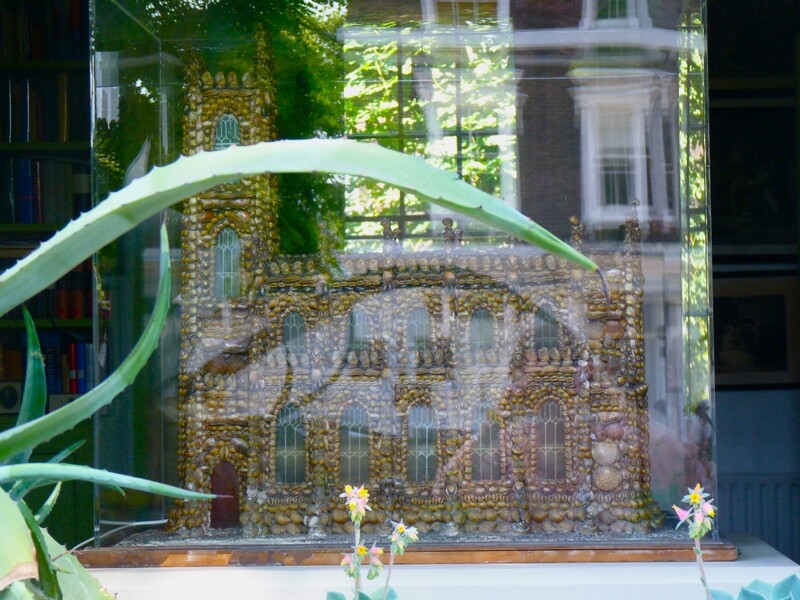 The relics and objects that he collected throughout his life were emblems of these deeply held tastes and beliefs. 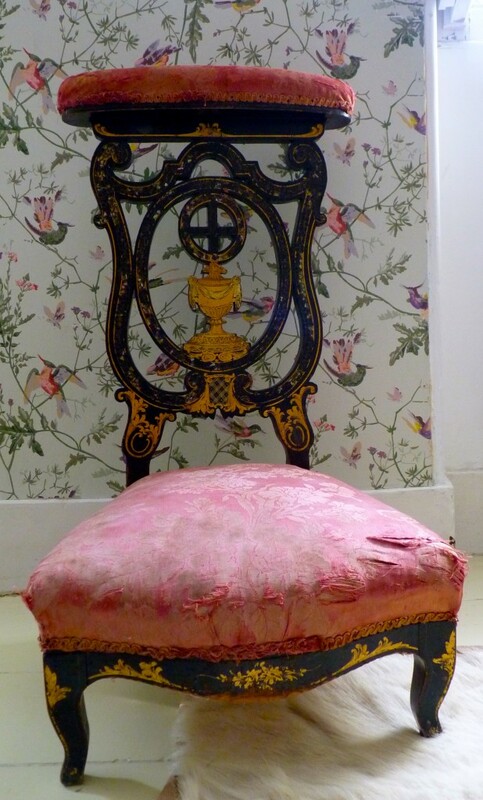 JB’s prie-dieu ebonised and embellished with mother of pearl. 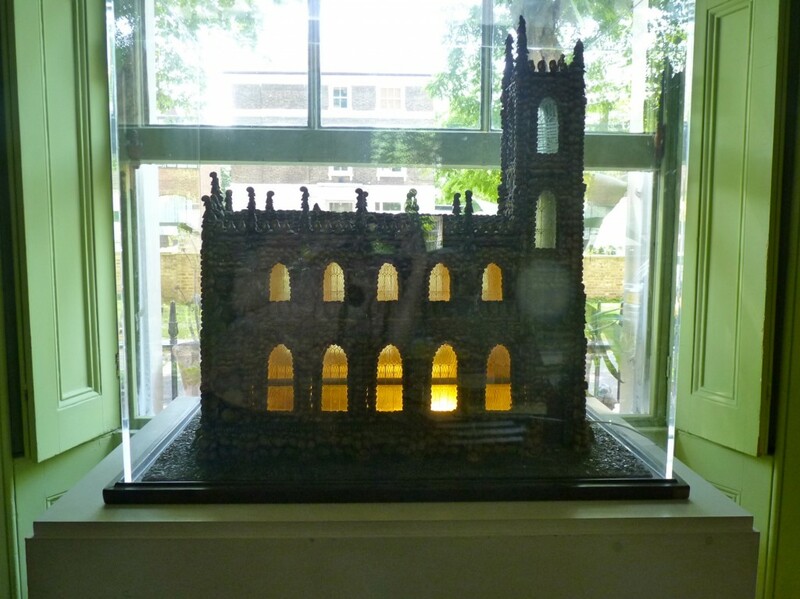 St. Mary’s Church Penzance, model encrusted with shells by an unknown maker, later furnished by Osbert Lancaster, with a gothic organ loft and a painted glass window at the west end. The church was bequeathed by JB to the Cornish historian A.L. Rowse. But earlier in his life, after he parted from Nonconfomism, he invested his childhood teddy bear, Archibald Ormsby-Gore with an almost fundamentalist passion for Nonconformist worship of the lowest and plainest kind. 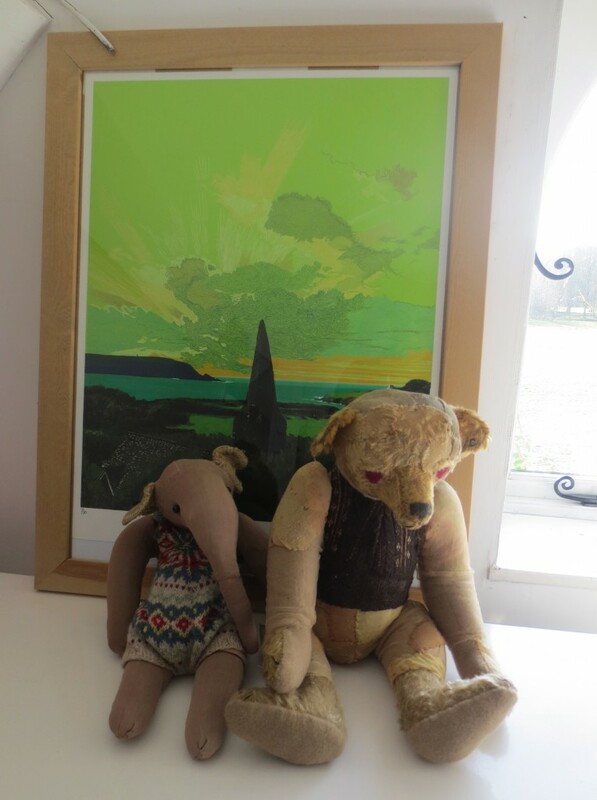 The bear Archibald Ormsby-Gore and his dimmer friend Jumbo, seen here back at home in the Vale of Uffington, propped against a painting of St. Enodoc’s, the Cornish church-next-the-sea where Betjeman lies buried. Archie’s fervour is evidenced in the story book, Archie and the Strict Baptists, that JB drew and wrote for his children, republished in 2006 by Long Barn Books. Archie eventually cut a pair of wings out of brown paper to fly, Icarus-like, over the fields to a chapel where his preferred creed of Strict Baptist was on offer. 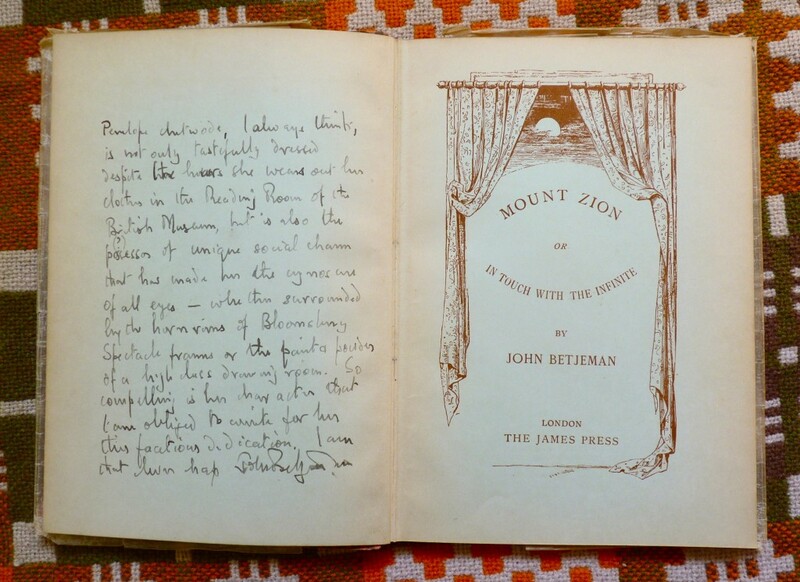 Betjeman’s antiquarianism and huge knowledge of architecture and topography were shared by his kindred spirit and friend John Piper. 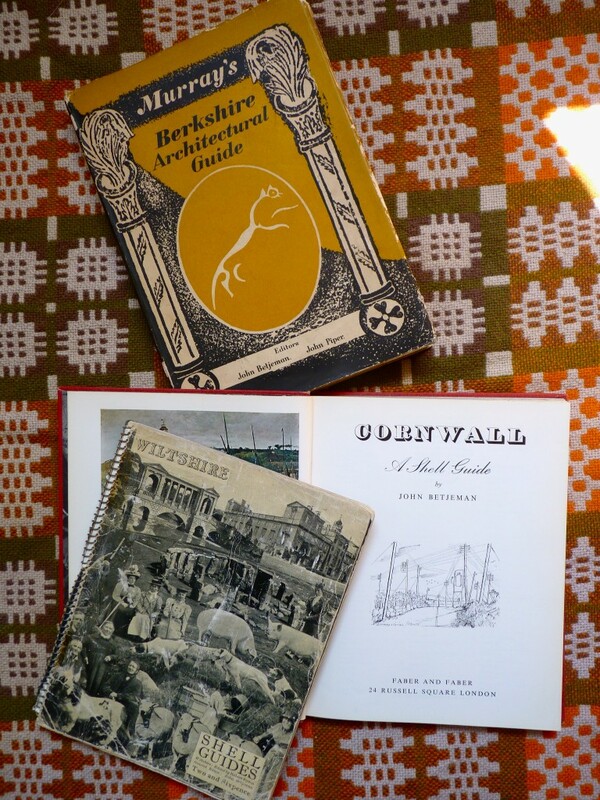 Together they collaborated on the Shell County Guides, and post-war, three more architectural guides for Murray’s publishing house, a series that was discontinued as the Shell Guides were revived. Betjeman was the author of the Shell Guide to Cornwall, ( 1934), revised in 1964, the surrealist collage for the cover of Wiltshire (1935), is by Lord Berners. His daughter Candida Lycett Green has followed the same paths and shares many of her father’s strongest tastes. She is the guardian of the bear Archie and his friend Jumbo; JB died with these two childhood toys resting in the crooks of his arms. She is the editor of her father’s letters and prose and the author of Unwrecked England, a column which she has written for The Oldie magazine since 1992; her latest book is Seaside Resorts (2011), and you can follow her on twitter. 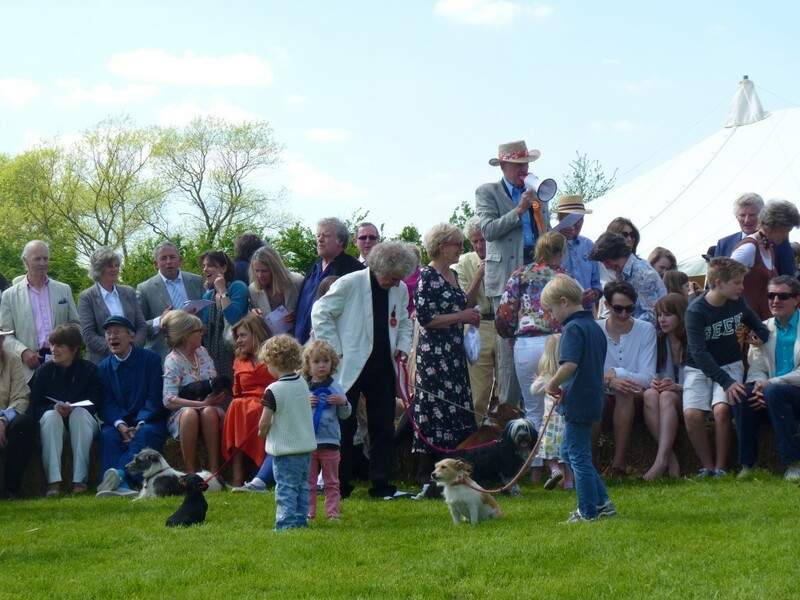 Here she is with with her husband Rupert Lycett Green, co-hosting one of their famously good parties on a boiling Sunday in May . 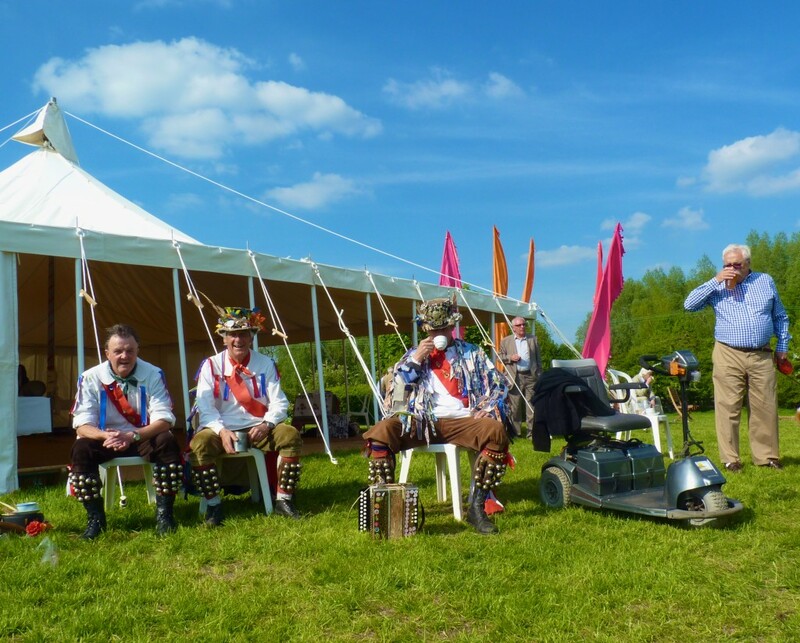 the Eynsham Morris ( seen here resting after their labours) and the Wantage Silver Band. 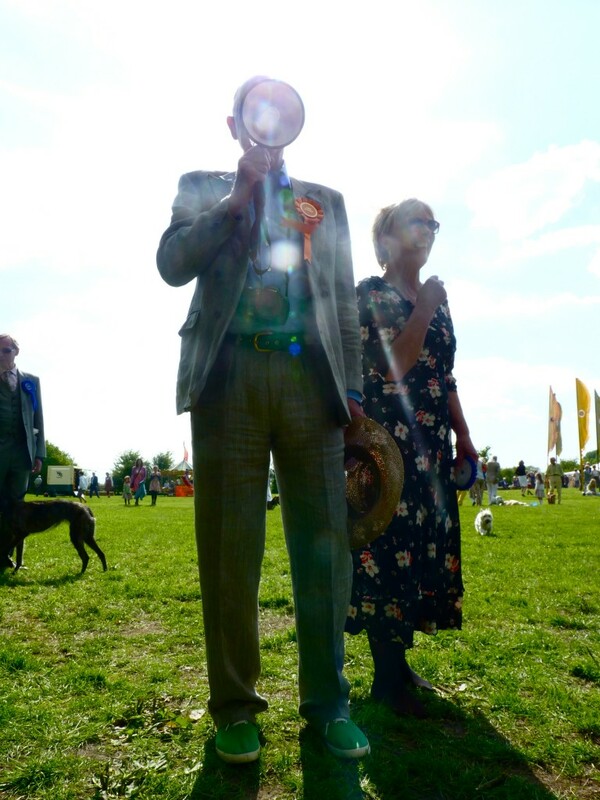 Each year it awards a generous prize of £1,000. 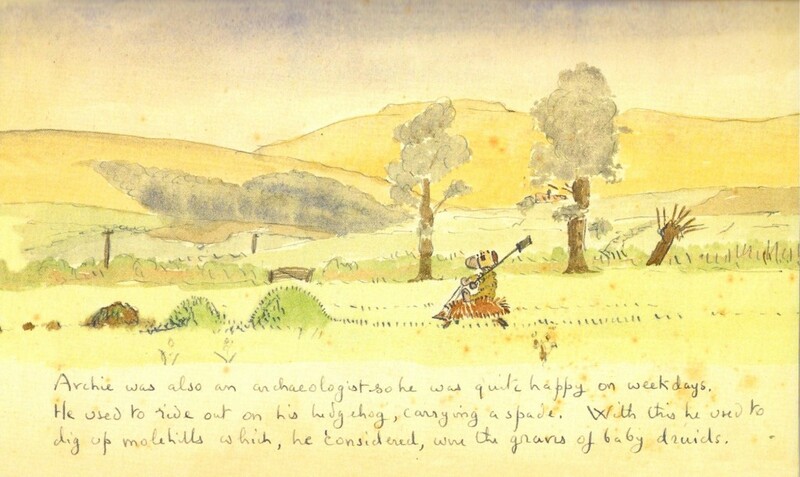 The same facetious tone often colours his poetry, but Betjeman had the bardic power of enchantment. 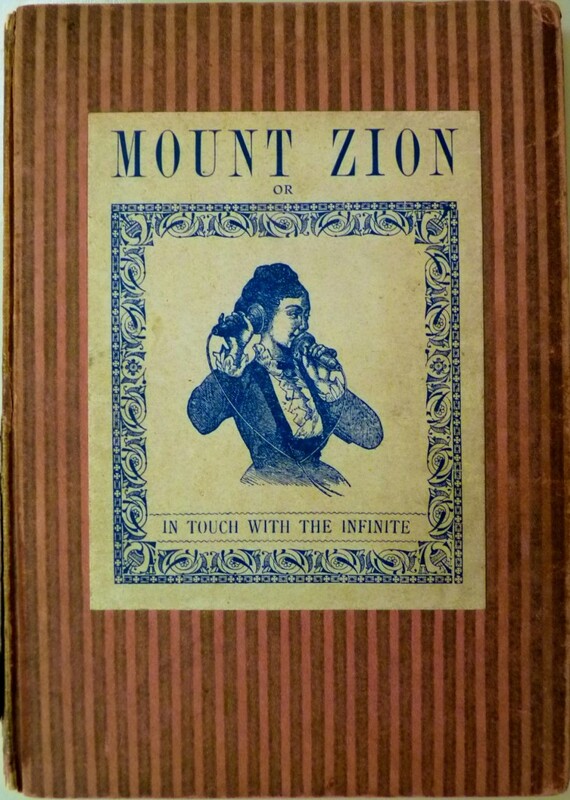 There, as here, his tone is a foil, lightly disguising a protestation of love, of beauty, tragedy or sympathy, the strong feelings and affections that made everything he wrote or said so eloquently real and true. I am going through your older posts. What a good one! Thank you for this post; but btw the cartoonist of Oxford University Chest is Osbert Lancaster, not O. Sitwell. I’m sure you’re familiar with Lancaster’s memoirs, All Done From Memory, but if not, I’d highly recommend them. 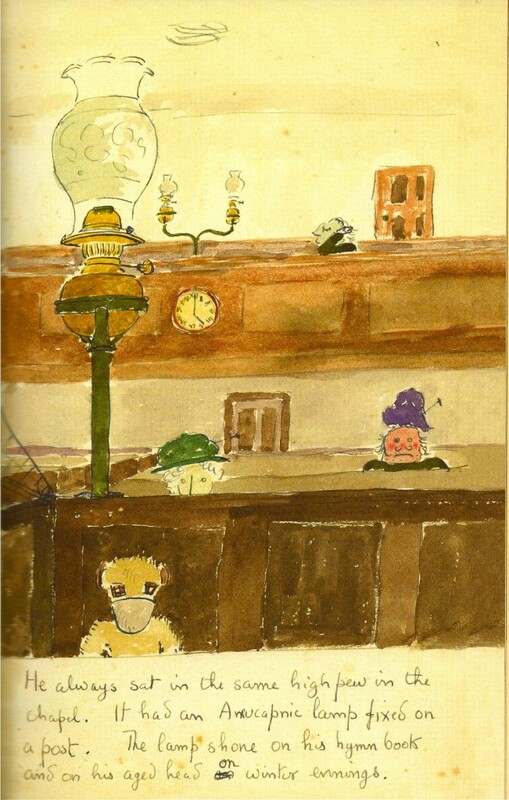 There’s a wonderful cartoon of his, of singing ‘Sumer is icumen in’ with the Betjemans and some other unlikely characters, which I think is in there somewhere and also in A.N. Wilson’s Betjeman. You are of course quite right and I have changed it. Thank You!